The Wake County Justice System 30-Year Facilities Master Plan document published in 2004 and updated in 2005 projected the need for a new courthouse complex. In 2006, this project was among the largest ever undertaken by the County and it again retained the O’Brien Atkins’ team that had successfully delivered the Wake County Public Safety Center twenty years earlier and which, at that time, was the largest project ever undertaken by the County. The Wake County Justice Center was delivered 6 months early and $30 million under budget. The Justice Center provides for three primary functions – Courthouse spaces, Public Records and Administration Offices and parking. The Courthouse has 19 courtrooms equipped with state-of-the-art technology, as well as more space for court support. Courtrooms generally stack with separate vertical and horizontal circulation systems between the judicial staff, detainees, and the general public, with the courtroom being the single space where all three groups assemble. The Justice Center houses the Clerk of Superior Court, Superior Court and District Court judges, District Attorney, Public Defender, Community Corrections, Register of Deeds, Revenue/Assessor, GIS Mapping, County Commissioners’ Public Meeting Room, the County Manager, the County Attorney and other support functions. The County’s Administrative Headquarters is an integrated part of this complex. Thus, separation, security and circulation were prime design challenges with the courts and county administration occupying the same building. 17 elevators along with escalators provide access. Significant upgrades in technology and security include: 200 video cameras throughout the building, secure corridors under constant control, x-ray security screening, metal detectors, trained staff on post, camera systems monitoring the building, weapons checks, emergency duress buttons and card access control. Two levels of below-grade parking provide 300 parking spaces. The below grade levels also provide space for central plant functions and various other service functions. The lowest parking level connects to the existing tunnel system beneath the Wake County Public Safety Center allowing for safe, secure movement of detainees to the new Justice Center. 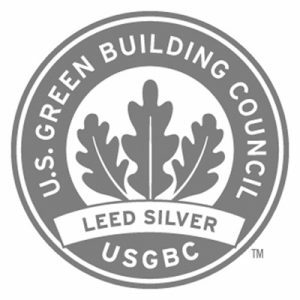 The Justice Center is LEED® Silver certified. The American Institute of Architects’ Academy of Architecture for Justice cited the Courthouse in its 2014 Justice Facilities Review.